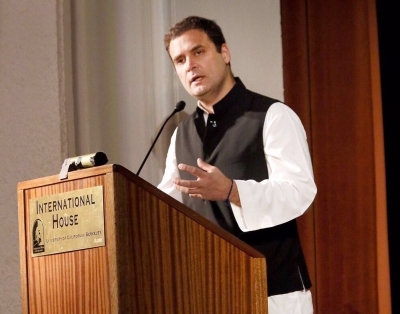 New York, Sep 21 (IANS) Congress Vice President Rahul Gandhi asserted that there was a growing concern in the US over threats to tolerance in India and asked the Non-Resident Indians (NRIs) to stand up against the “forces” that helped in dividing the nation. About 2,000 people attended the event held at a hotel in Times Square as a part of the Congress Party’s drive to build up its ranks among the NRIs. In his speech, he described the Congress as a “party of the NRIs”, citing leaders of the freedom movement who returned to India to lead the party. He said the “current focus on 50 or 60 big companies for economic growth was not going to solve the problem and only growing small and medium scale enterprises and encouraging entrepreneurship will work”. Another proposal was to network the Indian Institute of Technology’s and leading universities with the industry to make them world class institutions leading in innovation. Pitroda, who has taken over the NRI mission of the Congress as the chairman of its Overseas Department, organised Rahul Gandhi’s US visit. Pitroda said that the party’s immediate goal was to increase its 18 overseas units to 30 and set up chapters in every major US city. “Use social media responsibly,” Pitroda exhorted the audience, telling them to stay away from fake news and divisive messages.